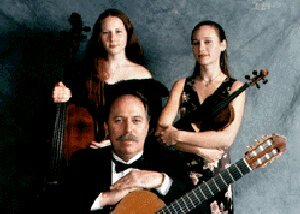 Dancing on Strings is a most extraordinary Family Trio that has been performing music in the Monterey Bay Area since 1987. The elements of family, virtuosity, style and the unique combination of guitar, violin and cello are complemented by the superb composing-arranging talents of Stephen Tosh. This collaboration has produced rave reviews about their lush full sound that often gives the impression of a larger chamber ensemble. From Bach to Rock you�ll hear it all like you�ve never heard it before! They also bring with them a special quality of professional and artistic sensibilities that will enhance any occasion. The varieties of venues range from Weddings and Corporate events to formal concerts.Please Contact us if you would like more information about upcoming performances or if you would like to book Dancing on Strings for your next engagement.